Crowds swell in the summer months at Put-in-Bay as vacationers visit Lake Erie to fish, boat, and relax, and as young scientists study at Stone Lab. 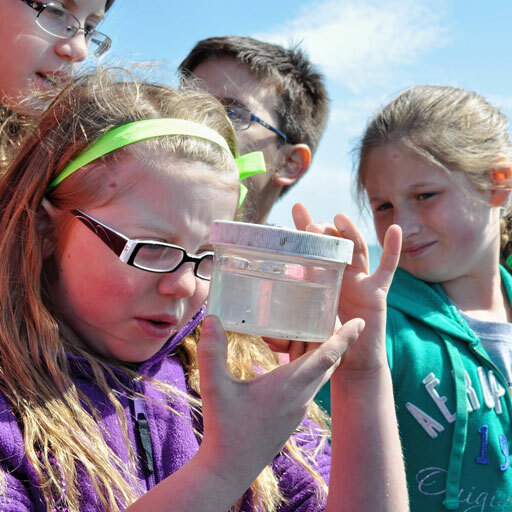 But students don't need to be the only ones having fun learning about Lake Erie. Visitors can take advantage of Ohio Sea Grant's science and history tours at landmarks all around the bay, from the South Bass Island Lighthouse to Gibraltar Island. The tours are a fun way to learn about Lake Erie without sitting through a traditional lecture. "We have the amazing opportunity to reach those visiting South Bass Island and Put-in-Bay," says Melinda Huntley, Ohio Sea Grant Extension's Sustainable Tourism Program Director. "Visitors are seeking interesting things to see and do, and Ohio Sea Grant can meet these needs while also teaching people about Lake Erie." The Aquatic Visitors Center, the historic State Fish Hatchery on South Bass Island, will be open from 11 a.m. to 5 p.m. Wednesdays through Saturdays, June 20-Aug. 18, with free admission. Guests can investigate artifacts from the center's history, use microscopes to inspect Lake Erie's tiniest inhabitants, and observe native fish in large aquaria. Children can try their hand at fishing on the pier for free by borrowing rods and bait provided by the Ohio Department of Natural Resources. Treasure hunting is another activity that will draw vacationers to the Aquatic Visitors Center, thanks to a geocache hidden near the building. The geocache is a small hidden container with its geographic coordinates available online. People plug the coordinates into their smartphone or GPS and track down the cache, which holds a finders' log and assorted prizes that are free to the finders. Coordinates for the Aquatic Visitors Center cache are available here. "Our geocache is a great way to bring people to an area of South Bass Island that they may not have otherwise visited,” said Rosanne Fortner, Ohio Sea Grant education coordinator, who originally hid the cache. "People geocache so they can learn something, and that's the very thing our cache does -- it introduces people to the Aquatic Visitors Center." On an island just across the bay from the Aquatic Visitors Center, visitors can get a look inside Stone Laboratory, the country's oldest freshwater biological field station, during the Gibraltar Island and Stone Laboratory Tour from 11 a.m. to 1 p.m. each Wednesday, June 20-Aug. 15. A tour fee of $10 ($5 for children 6-12) supports student scholarships for summer classes. To reach Gibraltar, visitors can take a water taxi at 10:45 a.m. from the Boardwalk Restaurant Harbor Taxi Landing on South Bass Island at a round-trip cost of $6. Tour guides lead one-hour walking tours of the island, including Perry's Lookout, the glacial grooves, Stone Lab buildings, and the outside of Jay Cooke's summer home, built in 1865. As a Civil War financier and the third owner of Gibraltar Island, Cooke hosted influential figures like President Rutherford B. Hayes and General William Sherman on the island. Guests also can learn about current Lake Erie research conducted at the lab, which helps increase understanding of some of the challenges facing Lake Erie's ecosystem. For a great view of Lake Erie and its islands, sightseers can climb the South Bass Island Lighthouse tower from 11 a.m. to 5 p.m., Mondays and Tuesdays, June 18-Aug. 14. Cost is $3, free for children under 6. You'll also discover information about a few of the 1,700 shipwrecks scattered across the floor of Lake Erie, and find out more about the lake's role as Ohio's most valuable natural resource. "Nationwide, people are visiting locations where they can see, tour, and learn about a place," Huntley says. "Our sites give visitors additional reasons to visit the islands, giving a boost to the local economy. They also are a fun way to learn about the lake, ongoing research, and how we can become better stewards." For more information about any tour, contact the Stone Lab Bayview Office at 419-285-1800 or click here.